The women in your church will face many disappointments in 2019 . . . from health issues to marriage crisis, from financial burdens to unmet expectations. How can you help women navigate these unfulfilled longings with hope? Introducing Elizabeth: Dealing with Disappointment, the latest study in our Women of the Bible series! This six-week resource includes Scripture memory, daily study, and group discussion questions, making it ideal for individual and group study. Request your free Elizabeth Bible study preview kit by February 15 to receive a digital book copy, a digital leader’s guide, and link to the first of six Elizabeth podcast episodes. I sat in my pastor’s office, crying. “It’s too much. I just can’t do it all,” I cried, while swiping tears away. Our church was in a transitional season where church members needed to pitch in more than ever. I loved my church and wanted it to grow and thrive. And so I said “yes” to everything. I taught women’s Bible study. I led a discipleship group. I hosted a small group in my home. And I said “yes” to my pastor’s request to write a curriculum for children’s ministry. Did I mention that was the year I started homeschooling? That’s how I ended up in my pastor’s office in tears. It’s no surprise that ministry is overwhelming. For those who serve in church leadership and (for the purposes of this post) in women’s ministry, there are high expectations—from both ourselves and those we serve. Often people expect ministry leaders to always be available and ready to address their problems. They expect us to know the answer to every question. They want women’s ministry events to be well organized and engaging, all the while keeping to the all-too-tight budget. It seems like there’s always someone dissatisfied with the Bible study chosen for this semester, and why wasn’t child care arranged for last night’s gathering? And since there’s never enough volunteers, ministry leaders find themselves filling every vacancy themselves. These high expectations are enough in themselves, but then we add our own personal expectations for how we perform, our desire for success in ministry, and the all-too-common quest to never let anyone down. I’m overwhelmed just thinking about it! Over time the pressures and demands of serving in ministry can lead to burnout. 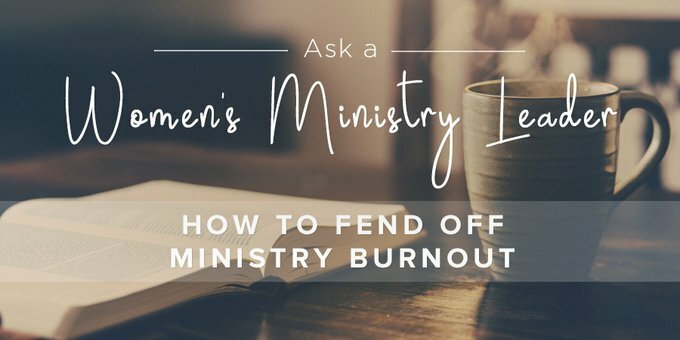 And such burnout not only harms the individual ministry leader, it impacts the whole church body because that leader often ends up stepping away from ministry life in the church. It’s important for ministry leaders to be aware of factors that contribute to burnout. Some of us have difficulty saying “no.” As a result, when asked to take on another ministry duty, we say “yes.” That can be fine if we have the margin for it, but all too often we find that we’re adding one responsibility after another to an already full plate. Saying “yes” to something when we don’t have the time for it stretches us beyond capacity. When we are doing too much, we’re not doing anything well. We get overwhelmed and exhausted. Things fall through the cracks, and the ministry suffers. It’s essential we set limits for ourselves and take on only what we can manage. This may mean saying “no” to leading another group or running the retreat planning team. This factor is often related to the above one. When we think we’re the only one who’s capable to complete a ministry task, we’re more likely to take on more tasks than we can adequately handle. I once heard a mentor share that often when we step away from a responsibility, it makes room for someone else to step in who had been waiting for the opportunity. We won’t know who God is preparing to fill a leadership need until we step aside. We may think we’re the only one who can manage a particular task, but in truth it’s God’s Church and He provides all the gifts and graces needed to build up the Body. As Paul reminds us in Romans 12:3–8, it takes many parts and many gifts to keep the Church functioning. As leaders, we ought to look for people who aren’t using their gifts and provide them an opportunity to do so. This too is intertwined with other factors. Not only do we take on too much and try to do it all on our own, we also fail to take the time to rest from our labors in ministry. It’s true, we were created for work, but God also created us to rest. In fact, rest is part of our creation design. When we rest from our work, we image our Creator God. Not only should we take time to rest on a weekly basis, we also should consider taking sabbaticals from our ministry. The ministry I serve in requires us to transition out of our roles every so many years so that a new person can come on board and bring a fresh perspective. This also helps prevent personality-driven ministry. That can be hard for us to do. Sometimes we think we own the role and responsibility we have in ministry. But we don’t. The ministry belongs to Christ. Having someone else step in and teach the Bible study we’ve taught the last ten years gives us an opportunity to rest, but it also gives someone else an opportunity to use their gifts. In ministry, we serve others. We teach, encourage, and equip. But what happens when we empty ourselves and fail to replenish? When we serve in ministry without abiding in Christ and His Word, we grow weak. We must be fed ourselves before we can teach and equip others. It’s not unlike the instruction the airline flight attendant gives to put the oxygen mask on our own face before helping our child with her mask. As leaders, we must feast and meditate on the Word, spend time in prayer, and abide in Christ before we minister to others. Effective ministry is only done out of the overflow of God’s Word at work in us. I learned a hard lesson the year I took on too many responsibilities. I learned my breaking point. I also learned that I cannot do it all on my own. The Church is designed to be built up by each of its members. Let’s not be lone rangers. May we know our limits, and may we work with the rest of the Body to encourage and build up the Church. Previous Post Help! It’s Sunday Morning! Next Post Should I Be Building My Own Platform?